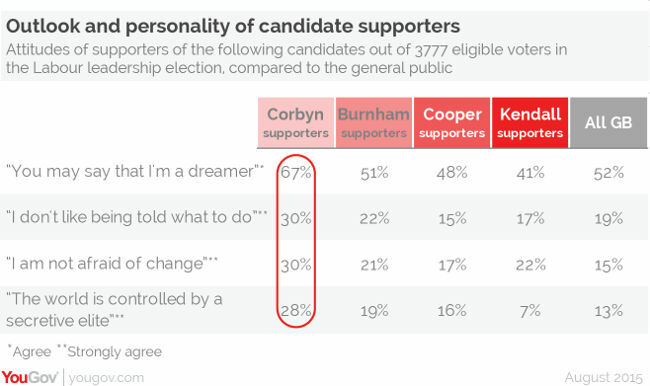 Those backing the North Islington MP are more likely to describe themselves as “dreamers”, oppose being told what to do and welcome change than those opting for the other three candidates in the election, according to data from the pollster YouGov. At first, the loose positivity of being a ‘dreamer’ seems to clash with the almost militant-sounding statements that the ‘world is controlled by a secretive elite’ and ‘I don’t like being told what to do.’ But in the context of a perceived political elite who have defined a permissible ‘centre-ground’ and who reject as extremist any ideas outside it, it makes perfect sense. It’s not necessarily about specific policies – they are intuitively more attracted to non-conformist alternatives and Jeremy Corbyn appeals to their broader world view. Other findings from YouGov’s polling, most of which took place in the first week of August, confirmed that Corbyn’s backers were generally poorer, more leftwing and more likely to get their news through social media than supporters of Andy Burnham, Yvette Cooper and Liz Kendall. Policies Corbyn’s lot strongly backed included utility nationalisation (86 percent), greater redistribution of wealth (85 percent), and less private sector involvement in healthcare (84 percent). Almost half disapproved of Royal Air Force (RAF) involvement bombing of Islamic State, two-fifths think university tuition should be entirely paid by the government, and almost two-thirds oppose the British royal family (the only sensible view – Ed). Rather bemusingly, 18 percent of all the Labour voters polled by YouGov did not claim to be interested in politics, and 15 percent did not describe themselves as leftwing, with a small segment seeing themselves as rightwing or centre-right.